I need to start by getting one thing out of the way.. previously the code to these Genesis programming experiments was released under a GPL license. I decided that's the wrong license for a Genesis game so all my original code is now under the MIT License. I'm not lawyer but I'm not even sure GPL can be used for a cartridge game running on proprietary hardware. For things like the Echo Sound Engine the original license text is retained as-is in the source files. I'm not interested in claiming someone else's work as my own. I started using GPL for all my projects out of frustration with the game editing community. Plenty of folks released cool free game editors but kept the source under lock & key. I never understood why unless they're purposely trying to be unhelpful to others who are learning how to make tools. For a community built on modifying the works of others they were strangely resistant to having their own work modified. So I made my utilities, like Hapsby and Aridia GPL so anyone could re-use the source provided their project complied with GPL. Releasing this code under the MIT License lets people use it more or less however they like. I don't think this code is especially great but it may be helpful to someone. If you do use some of my code I'd appreciate credit but that's it. In the next iteration I'll probably get around to starting a Github project for this. There are a couple things I want to clean-up before then that I didn't get around to yet. I have a feeling that every one of these articles will start with me fixing horrible bugs from the previous one. Unfortunately I can't buy an O'Reilly book to learn this, it's all trial and error. There are a couple good getting started tutorials on the internet but I'm getting past what they can help with. Even worse, I'm at the point where I Google various Genesis programming questions and just end-up finding my own page. I'm nowhere near an expert on the subject so that should give some indication of how scarce good information is. This leads me to believe that back in the day Genesis developers either had a lot of help from Sega or were way smarter than me (likely both). Also, I'm only able to spend a couple hours a week on this so I guess I shouldn't compare myself to someone working 40-60 hours a week on a game for months. Whatever, moving on..
One buggy bit I left around was a clipping issue in my collision detection routine. 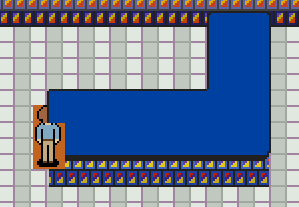 It was possible for the sprite to walk over/under things they shouldn't be able to. To troubleshoot this I borrowed a page from my Android SpriteWalker Demo and created some debug tiles. Doing this made it obvious what was going on.. The sprite's (x,y) position is the top left corner. 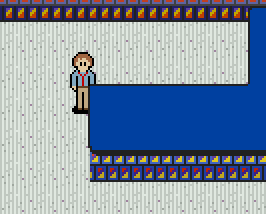 My first pass at collision detection looked at the sprite's (x,y) and the 8x8 column next to it. This works fine if the sprite always moves 8 pixels, like in the Phantasy Star games, but breaks if the spite can move freely. Of course, this is probably something I also debugged in that aforementioned Android demo. So much for learning from past mistakes. In the Phantasy Star games if the player just taps the controller their sprite will move 8 pixels, when holding a direction down the sprite always moves 8 pixels at a time and stops at some multiple of 8. This is the case for II and III at least, it's been a while since I played IV but I think the sprite motion is largely cloned from II. Using a fixed step makes collision detection a bit easier. I may go and change things so the sprite is locked into a virtual grid to make the collision detection routine simpler. At this point I can't say if the method I wrote will be a performance issue until I have more stuff going on in the demo. When I think about a game like Herzog Zwei though, where the game is managing two independent scrolling sections and dozens of sprites, it makes me suspect it will take a lot of bad code to slow things down. For now I'm going to keep plugging along with a system where the sprite can move fluidly around the map. This means updating the collision detection to check the left & right edges of the sprite when moving vertically, and the top & bottom edges when moving horizontally. cmpi.w #MAP_MID_X,d6 ; is sprite on the left or right side of the screen? cmpi.w #MAP_MID_X,d6 ; is right half on right side of the screen? cmpi.w #MAP_MID_X,d6 ; is collision on left or right side of the screen? The other thing annoying me was the sprite animation. My poor little sprite looked like he was having a seizure. There were two causes for this 1) I was updating the animation far too often 2) the animation frames didn't look like how an actual person walks. Let's start with the second of these issues. When the sprite was moving it was cycling through two frames. cmpi.w #SPRITE_ANIMATION_STEPS,(a5); is it time to update animation frame? cmpi.w #SPRITE_FRAME_COUNT,(a5) ; do we need to loop back to the start? cmpi.w #SPRITE_MOVE_FREQUENCY,(MEM_FRAME_COUNTER); is it time to move? What this does is throttle how often the animation frame changes. 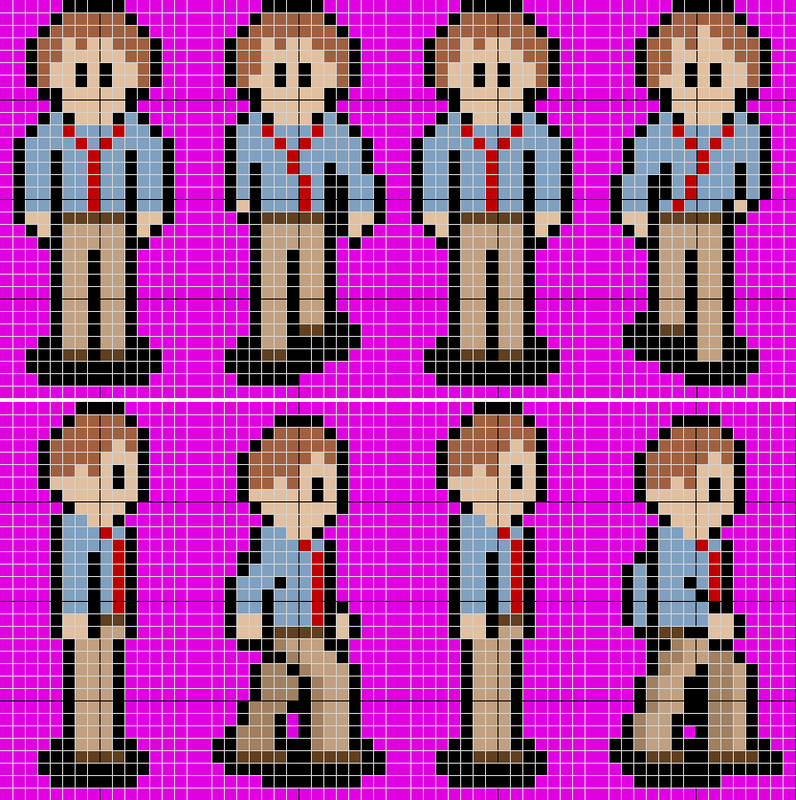 The sprite will keep their current animation frame for SPRITE_ANIMATION_STEPS and then toggle to the next one. The animation still isn't quite where I want it to be but it's enough of an improvement that I'm willing to move on. Maybe the next article will start with "OK, now I really think I fixed it for real this time, I'm super serious...."
Alright, it's finally time to add some new features. 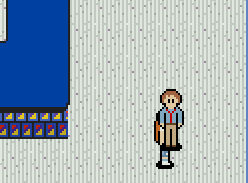 Our store employee seems a little lonely, so I added a new sprite I'm tentatively calling "1989 mall shopper". Try to not feel too inspired by that name. She is also modeled after a Phantasy Star II sprite which I'll eventually have to replace with a different style. Adding our shopper required creating the tiles & a new sprite definition, both of which appear in a previous article (and will be in the source code at the bottom of the page). An NPC can't just stand around, unless they're one of those types that's blocking an entrance or something. We need to make them pace around like any self-respecting NPC would. To make things interesting let's have the NPC move at a pseudo-random interval. They could move on a fixed interval, like every 1-2 seconds, but by randomizing it things look a bit more natural. When more NPCs are added they also won't all move in unison either, which would look really weird. So we need a random number generator. The Sega Genesis doesn't have a built-in random number generator, we need to write one. I'm going to use the EOR of two counters for this. In previous articles I added a counter for each time the main loop executes and another for each vblank event. Under normal game play an EOR of the two would look pretty darn random. Someone running the game frame-by-frame in an emulator could easily generate any random of their choice. The purpose of MEM_NPC1_MOVEMENT_COUNTER is to store how many steps the NPC has left in their current movement. This will be reused later whenever I get around to scripted events, like an NPC entering the scene on a fixed path. MEM_NPC1_MOVEMENT_INDEX is a pointer to an address in RandomNPCMovementStart. Again, this will be useful for scripted events. cmpi.w #$0000,(MEM_NPC1_MOVEMENT_COUNTER) ; is the NPC moving? cmpi.w #$20,MEM_NPC1_MOVEMENT_INDEX ; are we at the end of the array? This is all great except for one glaring problem, complete lack of sprite collision detection. 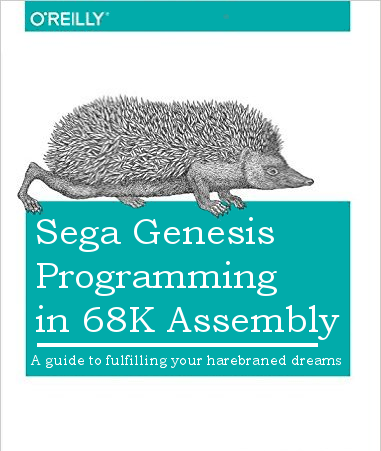 The Genesis contains hardware sprite collision detection. That's a great feature but it's also an after-the-fact notification. 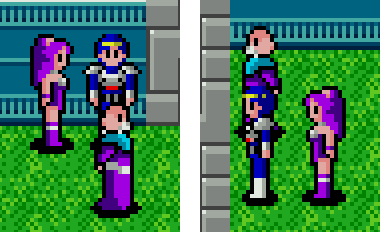 In the typical overhead RPG-ish game the characters can walk up to other sprites but not collide with them. 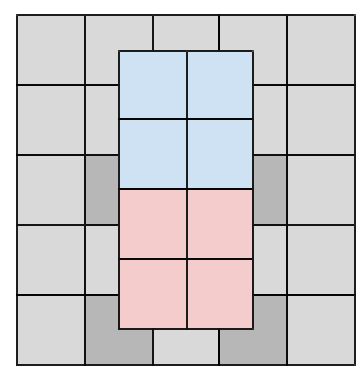 The blue boxes are the top half of the sprite, the red is the lower half, and the darker gray represent the blocked map data. cmpi.w #MAP_MID_X,d6 ; is column on the left or right side of the screen? Now we need a couple routines to block & clear map data. These will be called from MoveSprite and StopSprite. 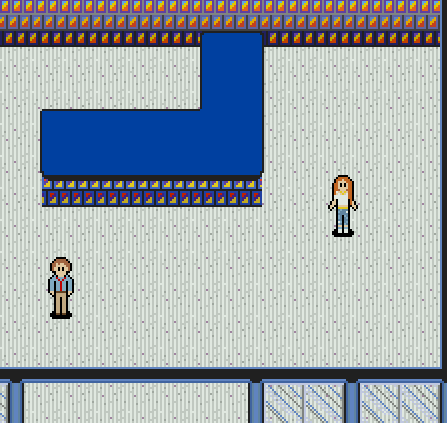 Now the sprites can't run into each other which is nice.